"Art is a nation's most precious heritage. For it is in our works of art that we reveal ourselves and to others the inner vision which guides us as a nation." Hua Hua Zhang graduated from the Beijing Performing Arts Academy, where she was trained as a performer in the ancient art of Chinese puppetry. 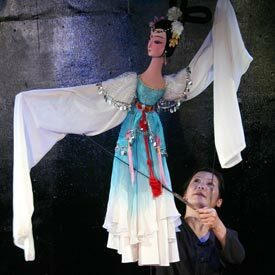 From 1974 to 1995 she toured nationally and internationally with the China Puppet Arts Troupe of Beijing. She received many awards for excellence in performance and direction. 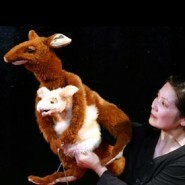 Hua Hua formed her own nonprofit company—Hua Hua’s Visual Expressions—to continue to develop her vision of the performing arts and to develop an art education program to share Chinese culture and puppet art with American audiences and students. 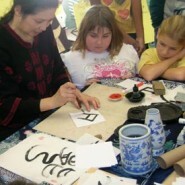 Since 2000, the company has mounted three productions that have toured throughout the United States: The Bell, a site mounted production using local artists that premiered at the University of Connecticut; East Meets West, a family-oriented production that has been performed in numerous venues including the Smithsonian Discovery Theater in Washington, D.C., the Boston Children’s Museum in Boston, and many schools and local theatres; and Butterfly Dreams, a mature-audience production which premiered at the Philadelphia Fringe Festival and has been performed at La Mama E.T.C. 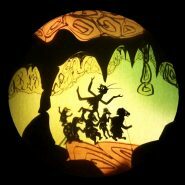 in New York and, in 2003, at the Worldwide Festival of Puppet Theatre in Charleville-Mezieres, France. Hua Hua was amazing and spellbinding!